Unitex® Uni-Dry Cote® Harbour Fine is trowel-applied (sponge finished) and suitable for a one-coat or two-coat application on all suitable masonry surfaces, eg Brick or Block etc, both inside and out, and is recommended to aid in the protection of masonry walls from the damaging effect of surface ingress of moisture. If the surface is in good order only a skim coat is required. Unitex® Uni-Dry Cote® Harbour Fine is a cement based polymer modified, High Performance Water Resistant and adhesion promoted masonry render system. Unitex Uni-Dry Cote® Harbour Fine is applied direct to sound and prepared masonry surfaces, either mechanically (sprayed) or by Trowel and rubbed up to a true and even surface with a float. This product is workable at thicknesses up to approximately 10mm. Unitex® Uni-Dry Cote® Harbour Fine enhances the appearance of masonry surfaces and may be sponge-finished for a concrete old world sandy surface effect or usually merely over coated with any of the range of Unitex Roll, Trowel or Brush Applied Texture coating systems. 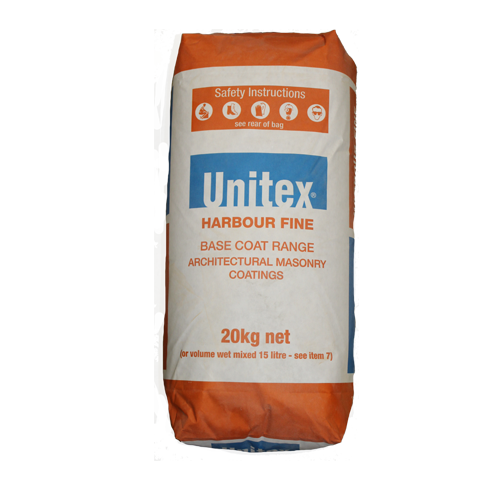 Unitex® Uni-Dry Cote® Harbour Fine is supplied in ready-to-use 20kg bags. Approximate coverage per bag is 2-4.5m² (as per substrate requirements). Unitex® Uni-Dry Cote® Render products are dry powder-based products. This means that you are getting a 100% active product. All that is required is for clean water to be mixed in, on site, immediately prior to application to the substrate. The recommended starting point is to add approx. 25% by volume, (based on the amount of powder render to be used), of water into a clean container (approx. 4.5 litres per bag). Then slowly add the powder, with drill mixing, until the desired slump (consistency) is achieved. Unitex® Uni-Dry Cote® Harbour Fine should be left a minimum 72 hours after application and wait until fully cured and dry (moisture meter measurement no greater than 12% WME) before over coating with a texture from the Unitex Applied Finishes range. Trowels on easily, smooth and up to 10mm thickness. Is polymer-modified for strong adhesion to surface. Is more waterproof than conventional render. Just Add Water – less margin for errors. Is ideal for renovation works or over new surfaces.